From executive producer, Elliot Berlin and the Informed Pregnancy Project: A breech baby is born nearly every four minutes in the United States. Until the year 2000, a woman could opt to birth her breech baby vaginally or via surgery. Then, in 2001, a study came out that took away one of those options. The study was later found to be faulty, but the damage was already done--vaginal breech birth was almost completely eliminated from medical school training and from delivery rooms. 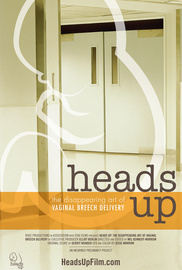 Heads Up features several women confronted with the disappearance of this option for their breech babies. Among others, actress Morena Baccarin and holistic living personality Kimberly Van Der Beek struggle to find providers who will attend them in a vaginal breech birth--all under the pressure of their imminent due dates. 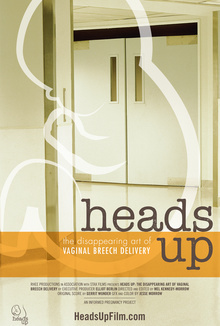 Through their personal accounts and the perspectives of medical professionals, Heads Up explores this widely misunderstood subject and the need to restore this lost art and lost option. 14 Comments. Add your thoughts.